Join us for mimosas as we chat with artists Leah Guadagnoli and Alex Ebstein about how they approach their individual art practices! VICTORI + MO is pleased to present I Just Want to See You Underwater, an exhibition of new works from Brooklyn-based artist Leah Guadagnoli. The exhibition, which marks Guadagnoli's solo debut with the gallery, will open on June 8 and will remain on view through July 22, 2018. The show will feature a series of high-spirited abstractions, and sculptures, which reference her custom shaped canvases. 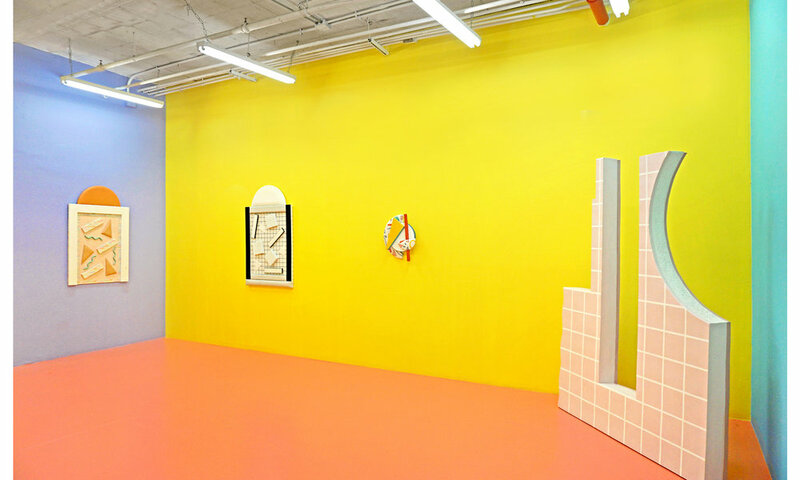 Guadagnoli’s three-dimensional wall-based constructions are firmly rooted within the historical context of geometric design through disparate influences as Egyptian hieroglyphics, Islamic and Gothic stained glass, Bauhaus and Swahili architecture, Art Deco and The Memphis Group. Inspired by the patterns and surfaces which recollect the gaudy carpets, seating, and walls found in the waiting rooms and airports, casinos and movie theaters of decades past, Guadagnoli’s work suggests a deliberately ambiguous nostalgia—some works may recall the '80s and '90s, others the '50s and '60s. The past and present are combined and act as reminders of what we were, who we are, and who we might become. Assertively jutting from the wall (often by more than a half-foot), her multi-paneled sculptural paintings break from the traditional picture frame, effectively blurring the line between painting and object. In conjunction with painted canvas, her work employs varied unorthodox materials including: printed fabric, upholstery, and polyurethane foam. These brazen, playful abstractions resist art-historical distinctions between high and low usually associated with serious contemporary painting. The boisterous physicality of her shaped canvases meld the geometric and the abstract, revealing a brash, dissonant visual language. Their eye-popping sunburned anti-aesthetic challenges formal assumptions regarding taste, exclusivity, and social engineering. At a distance, her work appears both as an improvisatory and homogenous whole. Only up close does the viewer become aware of the intensively constructed panels and an unexpected formal exuberance. Leah Guadagnoli lives and works in Brooklyn, NY. She received her MFA in Visual Art from Rutgers University in 2014 and her BFA in Painting and Art History from University of Illinois at Urbana-Champaign in 2014. She has had solo and two person exhibitions at 247365 (New York, NY) and Sadie Halie Projects (Minneapolis, MN), and most recently at Terrault (Baltimore, MD) with Alex Ebstein. Her work been included in group exhibitions at White Columns (New York, NY), Harper’s Books (East Hampton, NY), Asya Geisberg (New York NY), Cuevas Tillard (New York, NY), Ortega y Gasset (Brooklyn, NY), Deli Gallery (Brooklyn, NY) and Library Street Collective (Los Angeles, CA), among others. Guadagnoli has received support from Yaddo, The Lighthouse Works, Vermont Studio Center, The Wassaic Artist Residency, Tilleard Projects in Lamu, Kenya, and The Ora Lerman Charitable Trust. Her work has been reviewed in New American Paintings, Art F City, Hyperallergic, Maake Magazine, and Bmore Art. She is the founder of the Maple Terrrace Residency Program in Brooklyn, NY.